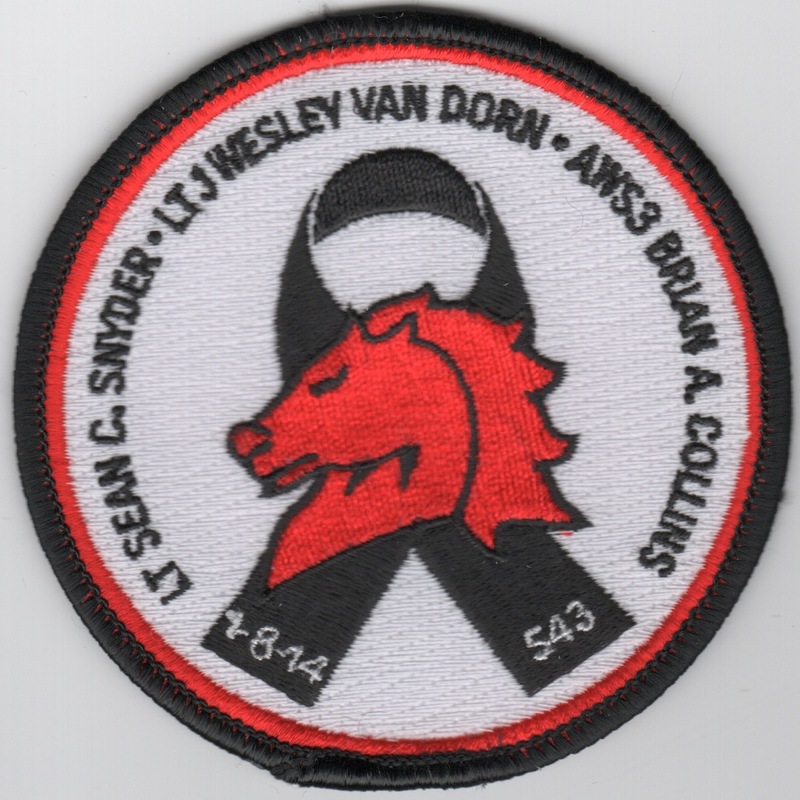 This patch is the white version and shows a "ribbon" with the squadron mascot emblazoned in the center. Along the top, there are 3 names listed (looks like crewmembers) memorializing them. I don't know the story behind it, but would love to make this a tribute to them, if anyone has any info. This patch does not have velcro attached. 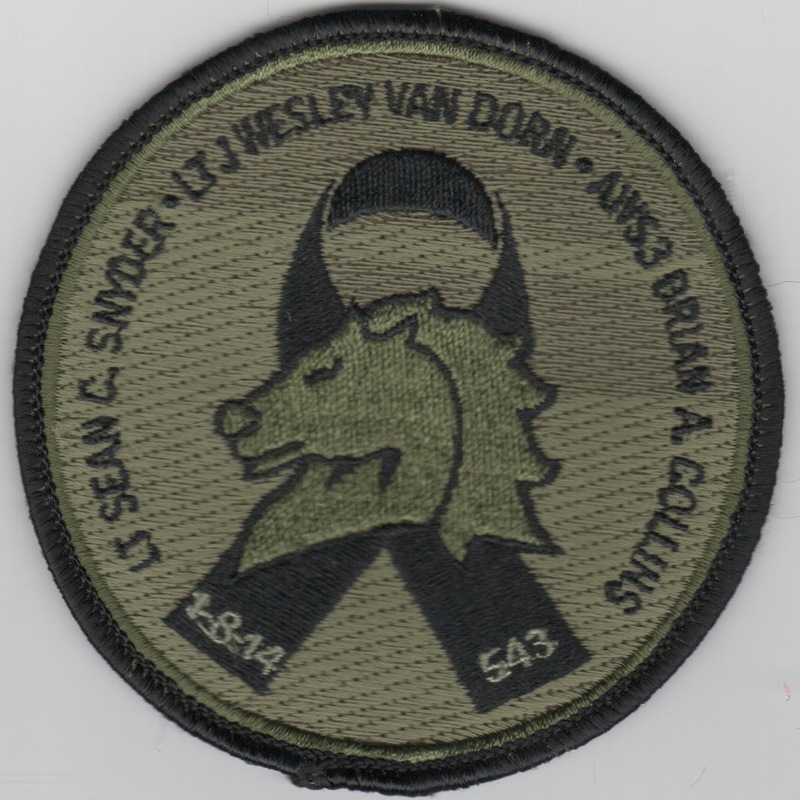 This patch is the subdued version and shows a "ribbon" with the squadron mascot emblazoned in the center. Along the top, there are 3 names listed (looks like crewmembers) memorializing them. I don't know the story behind it, but would love to make this a tribute to them, if anyone has any info. This patch does not have velcro attached. The 'Sea Stallions' were established in May 1978 and currently fly the MH-53E Sea Stallion out of NAS Norfolk, VA. They were one of the squadrons called upon after Desert Storm to clear mines from the Gulf. 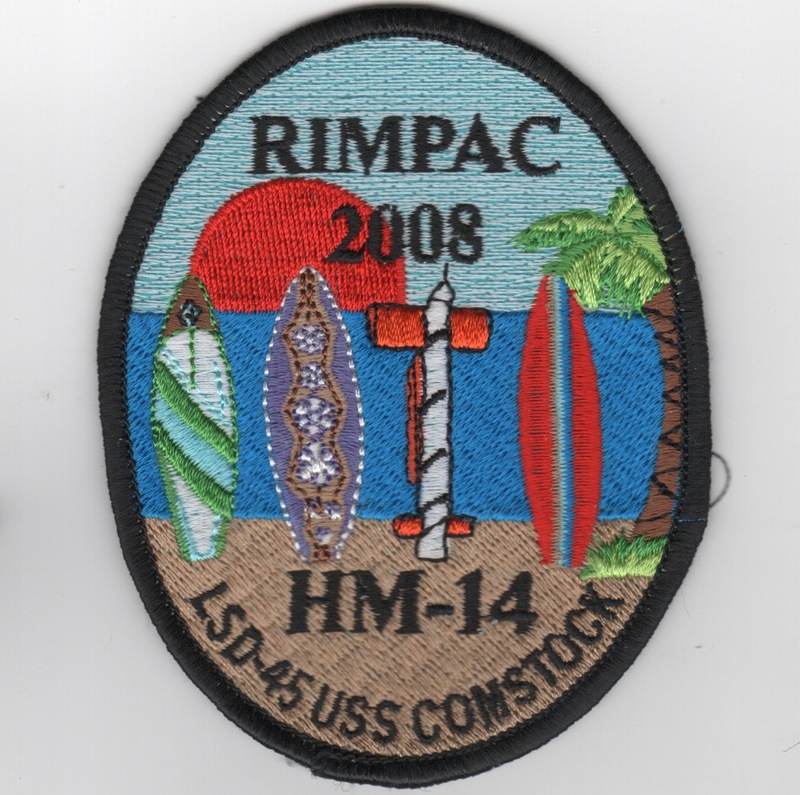 This is one of their detachment patches created for their 2008 RIMPAC tour. The 'Sea Stallions' were established in May 1978 and currently fly the MH-53E Sea Stallion out of NAS Norfolk, VA. They were one of the squadrons called upon after Desert Storm to clear mines from the Gulf. 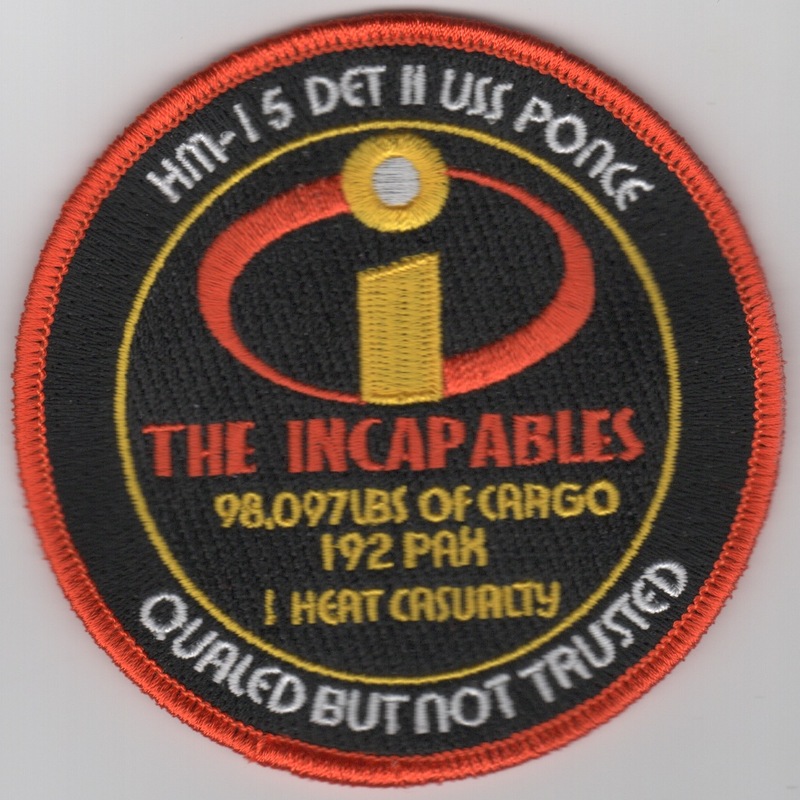 This is one of their detachment patches created for their Det-II while onboard the USS Iwo Jima and it states "Hurricane Chasers" along the bottom. The 'Sea Stallions' were established in May 1978 and currently fly the MH-53E Sea Stallion out of NAS Norfolk, VA. They were one of the squadrons called upon after Desert Storm to clear mines from the Gulf. This is one of their detachment patches created for their Det-II while onboard the USS Iwo Jima and it states "Southbound Troopers" on the diagonal stripe, very similar to the Army's Air Cavalry. The 'Sea Stallions' were established in May 1978 and currently fly the MH-53E Sea Stallion out of NAS Norfolk, VA. They were one of the squadrons called upon after Desert Storm to clear mines from the Gulf. This is the detachment patch created for their det down to Panama in 2005 while onboard the USS Bataan (LHD-5). The 'Sea Stallions' were established in May 1978 and currently fly the MH-53E Sea Stallion out of NAS Norfolk, VA. They were one of the squadrons called upon after Desert Storm to clear mines from the Gulf. This is the "workup" patch they made for the Combined Joint Task Force Exercise in 2004 off the East Coast. The 'Sea Stallions' were established in May 1978 and currently fly the MH-53E Sea Stallion out of NAS Norfolk, VA. They were one of the squadrons called upon after Desert Storm to clear mines from the Gulf. This is the ""Endless Summer" patch for 2004 that described their ops tempo. The 'Sea Stallions' were established in May 1978 and currently fly the MH-53E Sea Stallion out of NAS Norfolk, VA. They were one of the squadrons called upon after Desert Storm to clear mines from the Gulf. 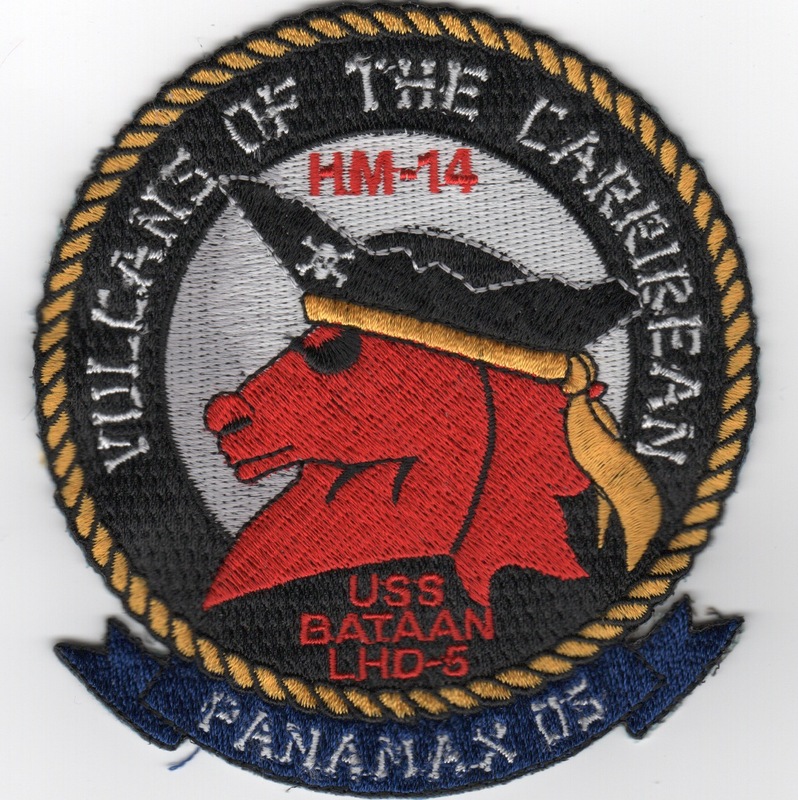 This is the ""Villains of the Carribean" patch for their 2005 "workups". The 'Sea Stallions' were established in May 1978 and currently fly the MH-53E Sea Stallion out of NAS Norfolk, VA. They were one of the squadrons called upon after Desert Storm to clear mines from the Gulf. 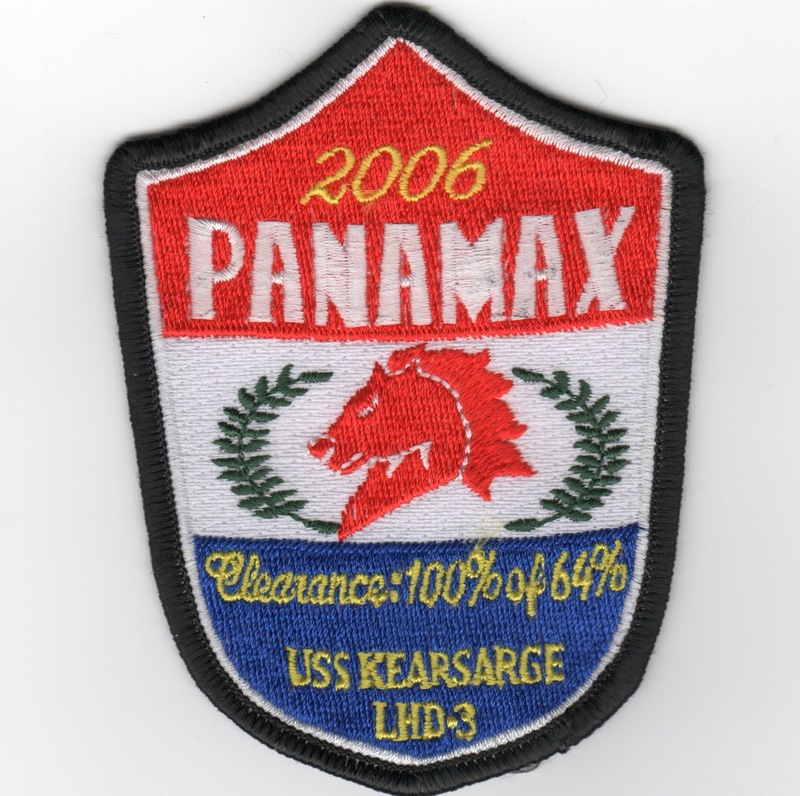 This is the "PANAMAX" patch for their 2006 "workups" and says "CLEARANCE: 100% OF 64%". Helicopter Mine Countermeasures Squadron 15 (HM-15) is a United States Navy helicopter squadron established in 1987 and based at Naval Station Norfolk, Virginia. Nicknamed the "Blackhawks" and flying the MH-53E Sea Dragon, it is staffed by both active duty and reserve personnel. It is the sister squadron to HM-14, the "Vanguard", based a half-mile away at Naval Station Norfolk, VA. 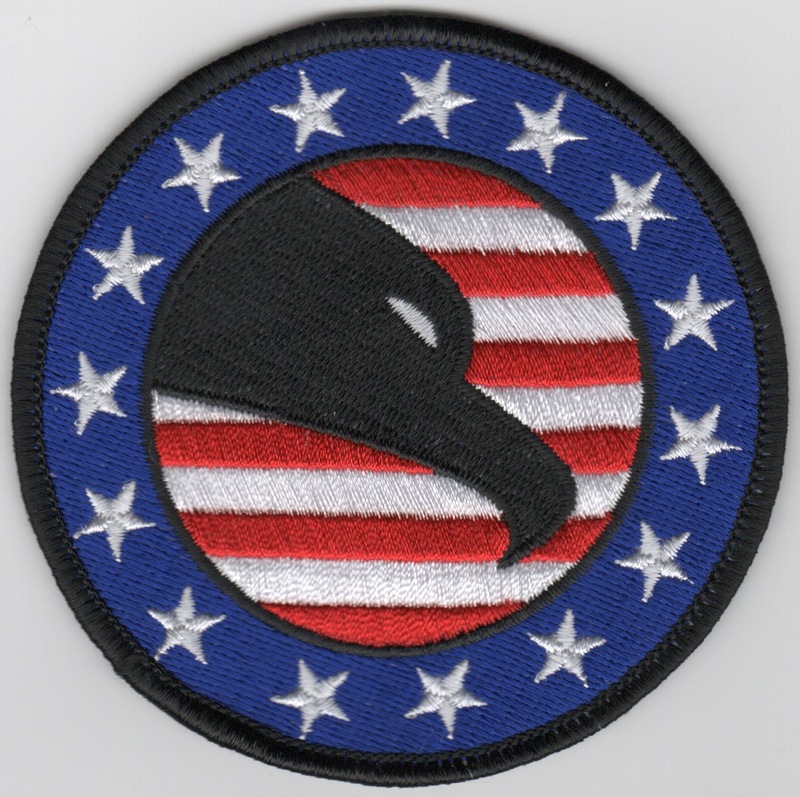 This is the small, color version of their squadron patch and does not come with velcro already attached. Helicopter Mine Countermeasures Squadron 15 (HM-15) is a United States Navy helicopter squadron established in 1987 and based at Naval Station Norfolk, Virginia. Nicknamed the "Blackhawks" and flying the MH-53E Sea Dragon, it is staffed by both active duty and reserve personnel. It is the sister squadron to HM-14, the "Vanguard", based a half-mile away at Naval Station Norfolk, VA. This is the medium-sized, color version of their squadron patch and does not come with velcro already attached. Helicopter Mine Countermeasures Squadron 15 (HM-15) is a United States Navy helicopter squadron established in 1987 and based at Naval Station Norfolk, Virginia. Nicknamed the "Blackhawks" and flying the MH-53E Sea Dragon, it is staffed by both active duty and reserve personnel. It is the sister squadron to HM-14, the "Vanguard", based a half-mile away at Naval Station Norfolk, VA. This is the medium-sized, desert version of their squadron patch and does not come with velcro already attached. Helicopter Mine Countermeasures Squadron 15 (HM-15) is a United States Navy helicopter squadron established in 1987 and based at Naval Station Norfolk, Virginia. Nicknamed the "Blackhawks" and flying the MH-53E Sea Dragon, it is staffed by both active duty and reserve personnel. It is the sister squadron to HM-14, the "Vanguard", based a half-mile away at Naval Station Norfolk, VA. This is the medium-sized, subdued version of their squadron patch and does not come with velcro already attached. Helicopter Mine Countermeasures Squadron 15 (HM-15) is a United States Navy helicopter squadron established in 1987 and based at Naval Station Norfolk, Virginia. Nicknamed the "Blackhawks" and flying the MH-53E Sea Dragon, it is staffed by both active duty and reserve personnel. It is the sister squadron to HM-14, the "Vanguard", based a half-mile away at Naval Station Norfolk, VA. 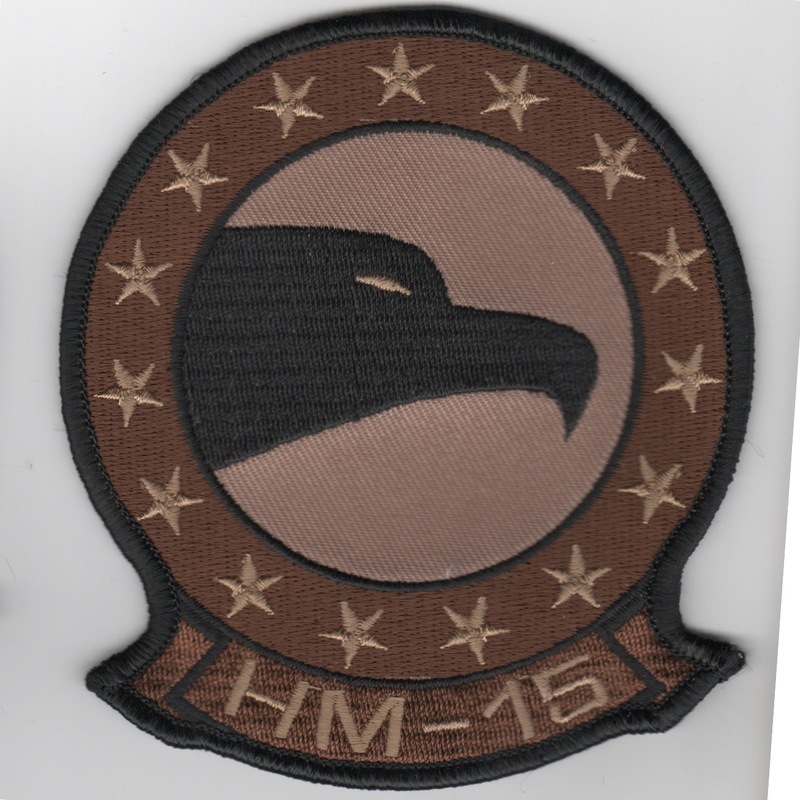 This is the 'FIGHTING HAWKS' version of their squadron patch with the blue 'tab' (bottom) and does not come with velcro attached. Helicopter Mine Countermeasures Squadron 15 (HM-15) is a United States Navy helicopter squadron established in 1987 and based at Naval Station Norfolk, Virginia. Nicknamed the "Blackhawks" and flying the MH-53E Sea Dragon, it is staffed by both active duty and reserve personnel. It is the sister squadron to HM-14, the "Vanguard", based a half-mile away at Naval Station Norfolk, VA. 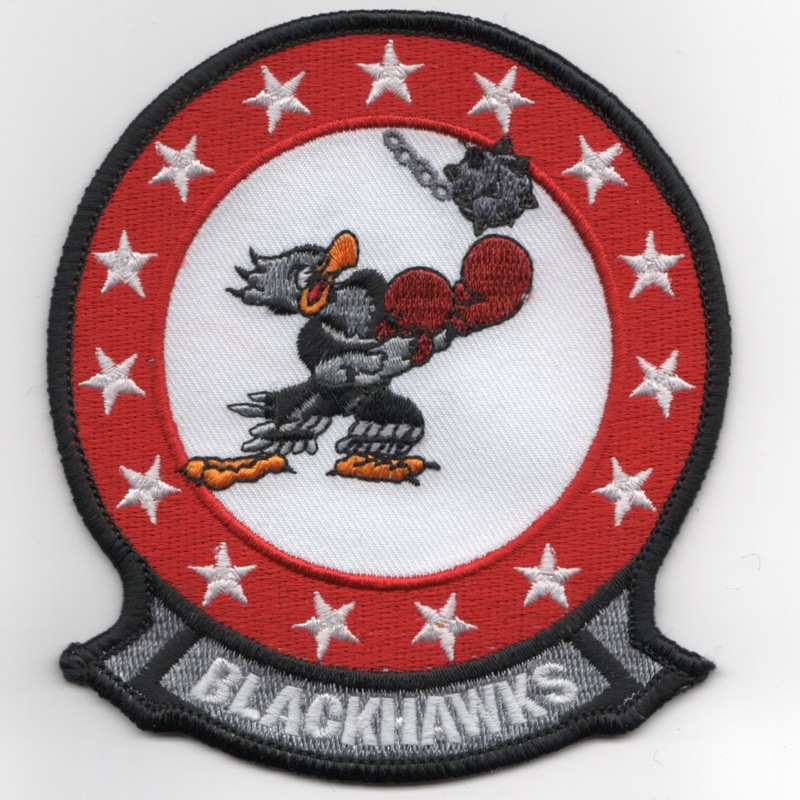 This is the 'BLACKHAWK' version of their squadron patch with the gray 'tab' (bottom) and does not come with velcro attached. 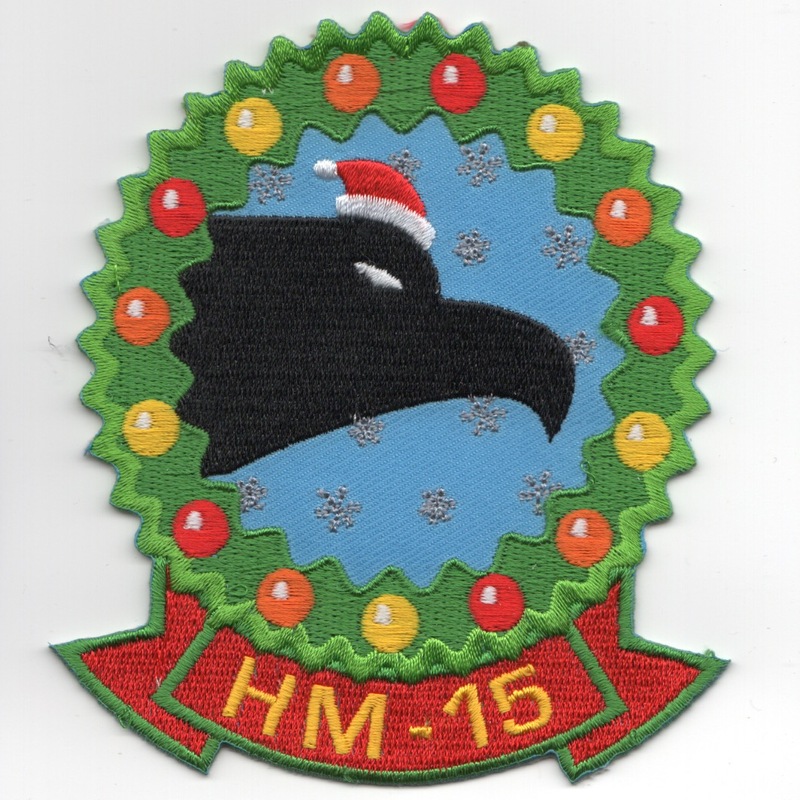 This is the 'CHRISTMAS'-wreath version of the squadron patch created by the squadron to celebrate the hoidays. This patch does not come with velcro attached. Helicopter Mine Countermeasures Squadron 15 (HM-15) is a United States Navy helicopter squadron established in 1987 and based at Naval Station Norfolk, Virginia. Nicknamed the "Blackhawks" and flying the MH-53E Sea Dragon, it is staffed by both active duty and reserve personnel. It is the sister squadron to HM-14, the "Vanguard", based a half-mile away at Naval Station Norfolk, VA. This is their detachment patch created for Det-2 on the USS PONCE. It says "QUAL'ED BUT NOT TRUSTED" at the bottom. Helicopter Mine Countermeasures Squadron 15 (HM-15) is a United States Navy helicopter squadron established in 1987 and based at Naval Station Norfolk, Virginia. Nicknamed the "Blackhawks" and flying the MH-53E Sea Dragon, it is staffed by both active duty and reserve personnel. It is the sister squadron to HM-14, the "Vanguard", based a half-mile away at Naval Station Norfolk, VA. 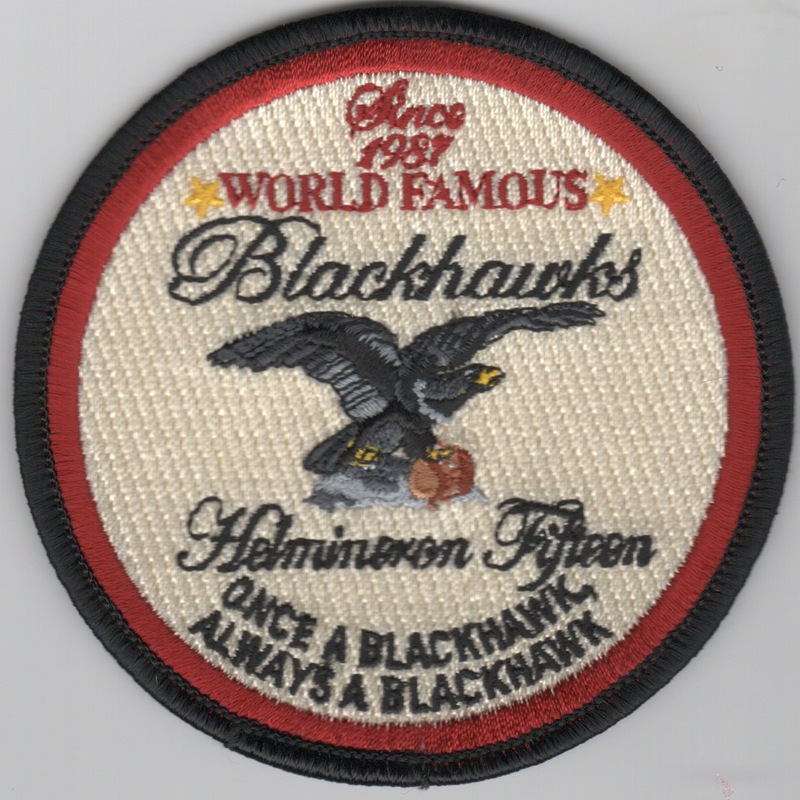 This is one of their detachment patches (unsure which det), but says "World Famous Blackhawks Since 1987" (along the top) and "Once a Blackhawk, Always a Blackhawk" (along the bottom). 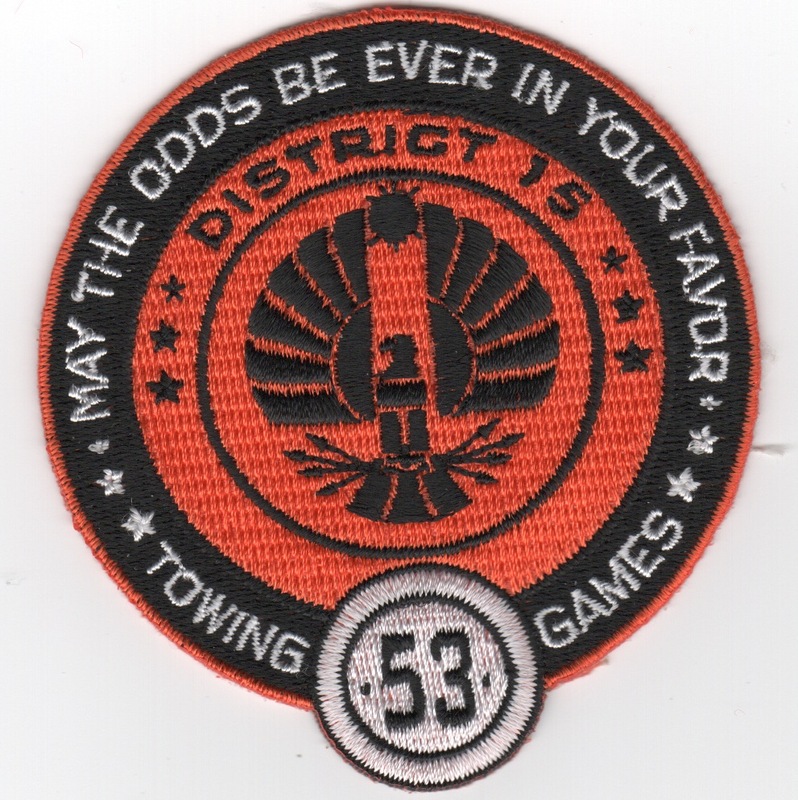 This is HM-15 DET-2 "MAY THE ODDS BE EVER IN YOUR FAVOR" patch showing the logo from "DISTRICT 15" logo(?) and says "TOWING GAMES" either side of the "53" for the MH-53. 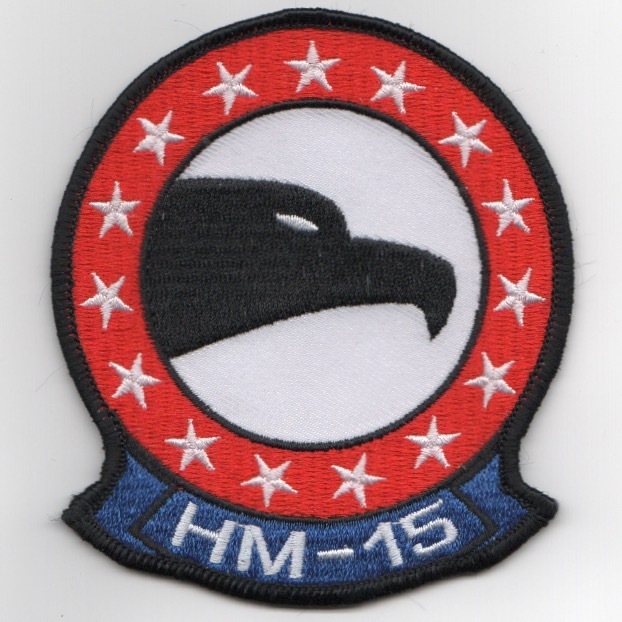 It was made for HM-15, a Navy MH-53E Airborne Mine Countermeasures squadron (hence "District 15", "53" and "Towing" in the patch) � based out of Norfolk, VA and also a forward deployed DET in Bahrain. 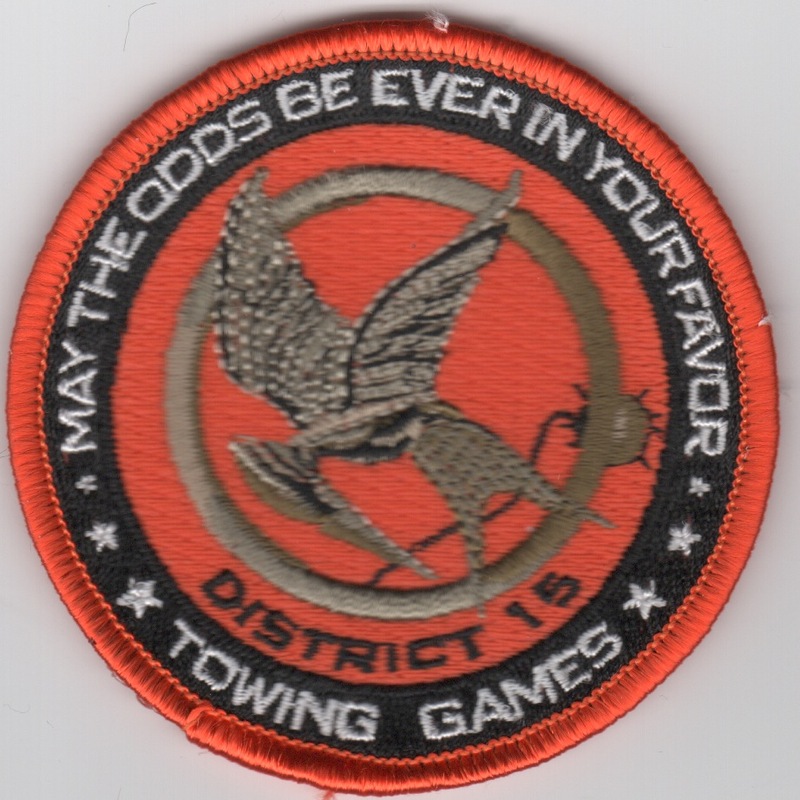 This is HM-15 DET-2 "MAY THE ODDS BE EVER IN YOUR FAVOR" patch showing the logo from "DISTRICT 15" logo(?) and says "TOWING GAMES" at the bottom. 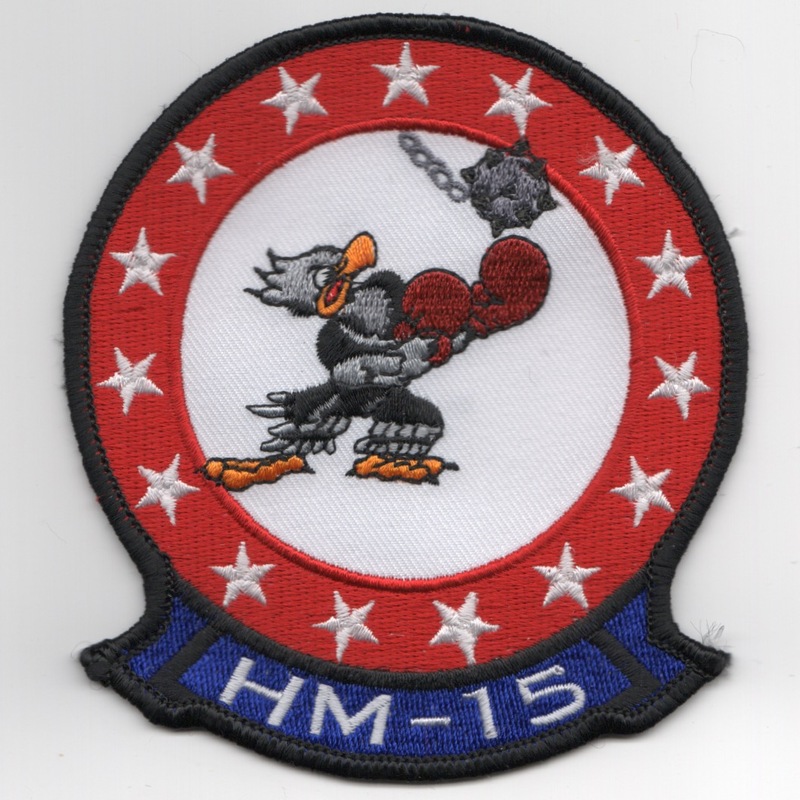 This one was also made for HM-15, a Navy MH-53E Airborne Mine Countermeasures squadron (hence "District 15", "53" and "Towing" in the patch) �based out of Norfolk, VA and also a forward deployed DET in Bahrain. Helicopter Mine Countermeasures Squadron 15 (HM-15) is a United States Navy helicopter squadron established in 1987 and based at Naval Station Norfolk, Virginia. Nicknamed the "Blackhawks" and flying the MH-53E Sea Dragon, it is staffed by both active duty and reserve personnel. It is the sister squadron to HM-14, the "Vanguard", based a half-mile away at Naval Station Norfolk, VA. 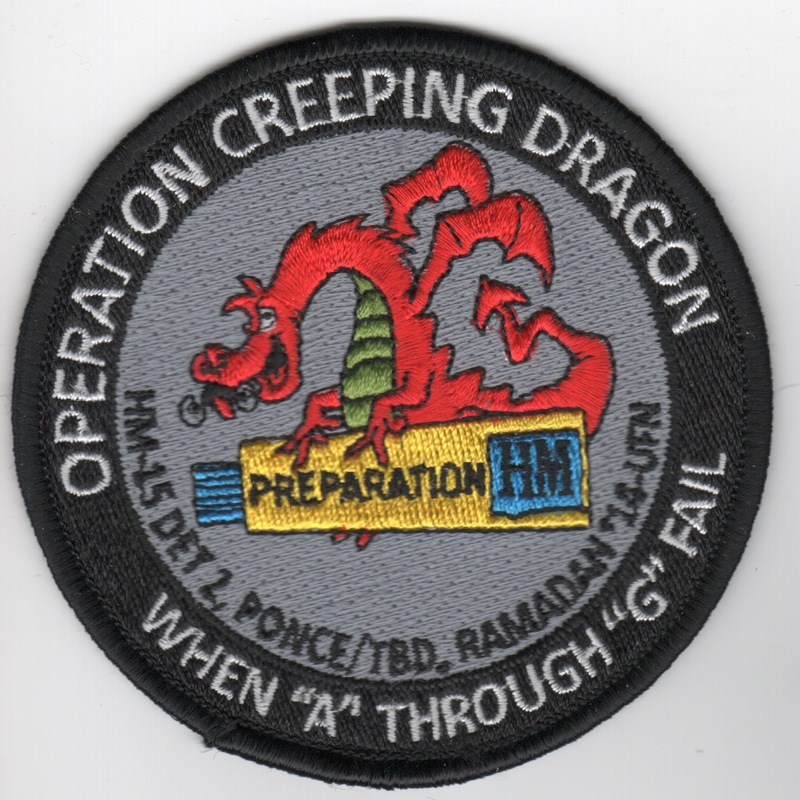 This is one of their Det-2 patches, and says "OPERATION CREEPING DRAGON" (along the top) and "When 'A' through 'G' Fail" (along the bottom). 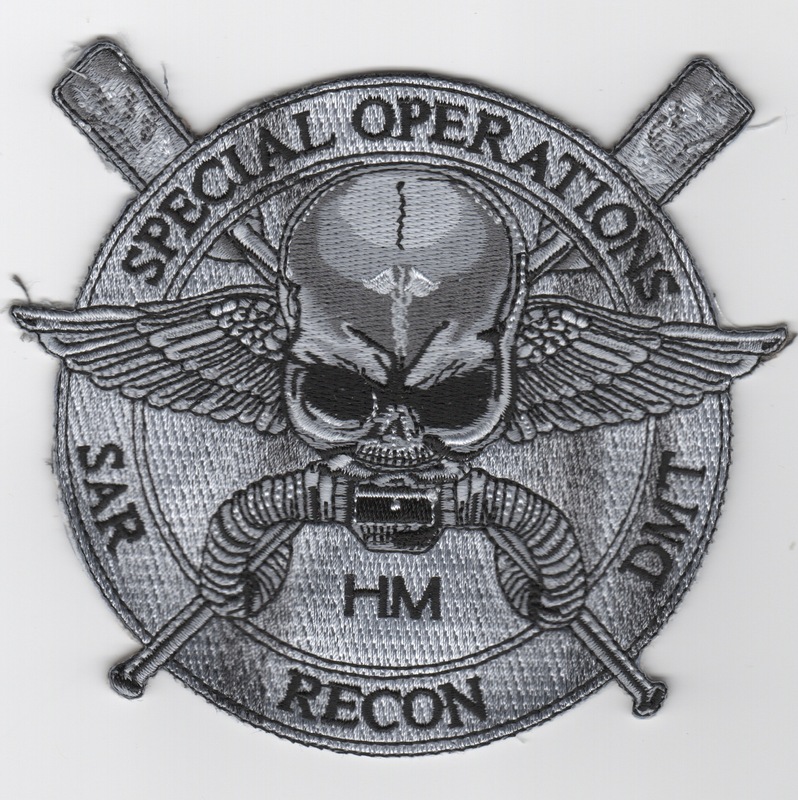 This is the gray "Special Operations" patch created for the HM community. It shows a Skull with SCUBA gear and wings. 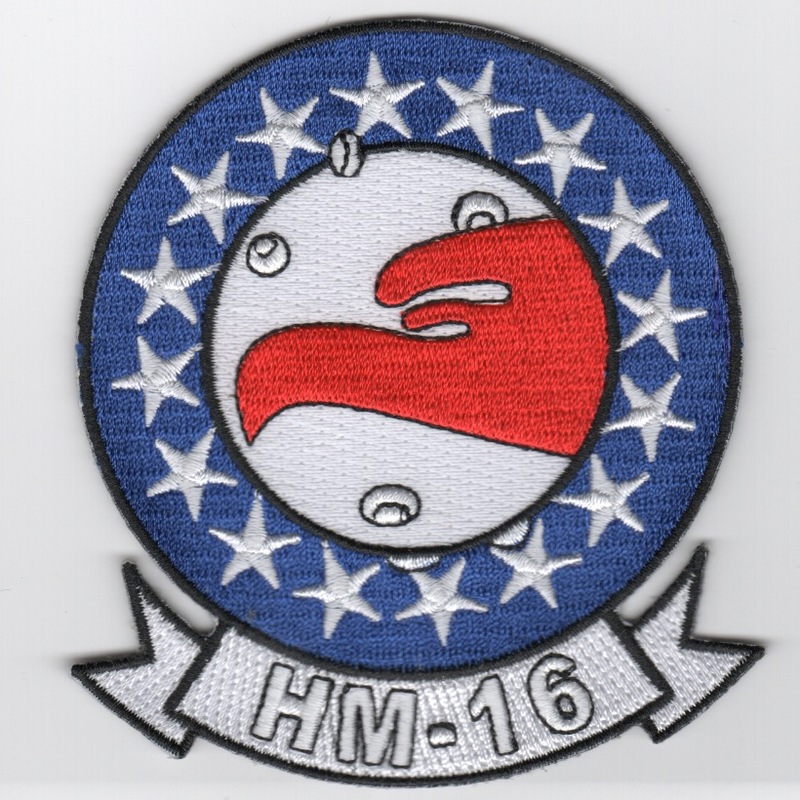 This patch denotes the fact that HM-14 tows minesweepers through minefields to detect and detonate ones they find. 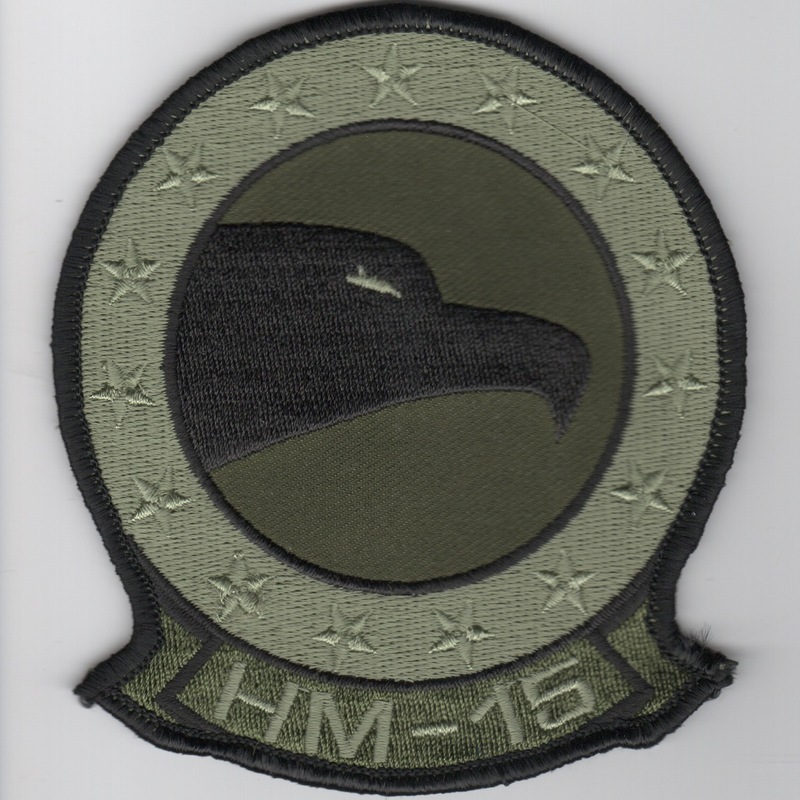 This is the squadron patch for the HM-16 Seahawks. They were established on September 20, 1974 and flew the Sikorsky RH-53D Sea Stallion until they were decommissioned on January 2, 1987. This patch does not come with velcro attached. Homepage | Order HM Patches!